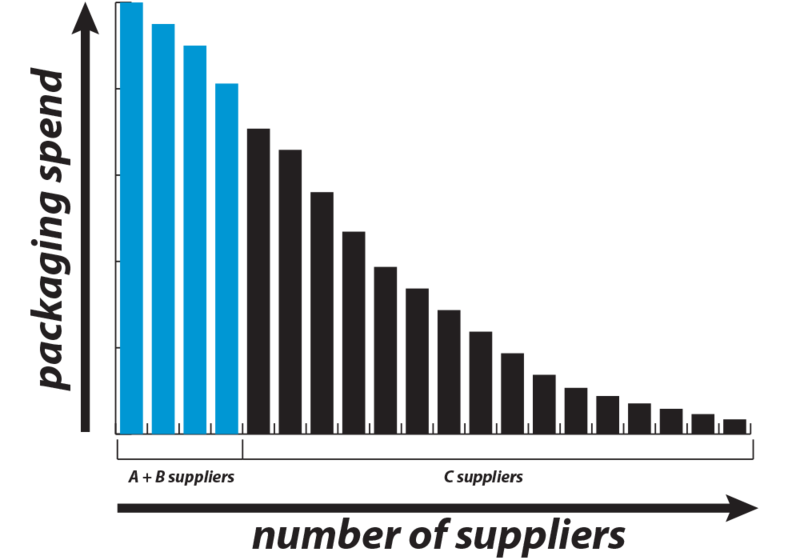 Generally speaking companies buy 70% to 80% of their total packaging spend from 5% to 10% of their packaging suppliers. As a result, 90% to 95% of the vendors must be maintained, although they only represent 20% to 30% of the total packaging spend. However, they are needed to enable the core business of these companies. If you look at the current practice, you often see that the smaller vendors are responsible for process disruption with many negative consequences (streamline of the supply chain, performance towards the customers, etc). Besides this, all these vendors must be 'managed' by the buyer, which is very complex. You will notice that the total workload to manage these 90% to 95% of the vendors takes 4 to 5 times more time and effort compared to the 5% to 10% of the biggest vendors. Consolidation by outsourcing your tail-end packaging need is the key to solve this friction between workload/effort and impact/importance. Another positive influence of supplier reduction is a more controllable vendor management system.